Ajanta Caves are situated in which state of India? Since 1983, the Ajanta Caves have been a UNESCO World Heritage Site. The Ajanta Caves are 29 (approximately) rock-cut Buddhist cave monuments which date from the 2nd century BCE to about 480 CE in Aurangabad district of Maharashtra state of India. The caves include paintings and rock-cut sculptures. According to UNESCO, these are masterpieces of Buddhist religious art that influenced the Indian art. The caves were built in two phases, the first phase starting around the 2nd century BCE, while the second phase was built around 400–650 CE. The site is a protected monument in the care of the Archaeological Survey of India. Le Corbusier was a Swiss-French architect, designer, painter, urban planner, writer, and one of the pioneers of what is now called modern architecture. Le Corbusier prepared the master plan for the city of Chandigarh in India. On 17 July 2016, seventeen projects by Le Corbusier in seven countries were inscribed in the list of UNESCO World Heritage sites as The Architectural Work of Le Corbusier. The Group of monuments in Pattadakal designated under UNESCO World Heritage List, in 1987, covers a remarkable series of nine Hindu temples, as well as a Jain sanctuary in northern Karnataka. These are a remarkable combination of temples built by the Chalukya Dynasty. Pattadakal is considered a Hindu holy city and within the heritage complex are eight temples dedicated to Shiva, a ninth shaivite sanctuary called the Papanatha Temple, and a Jain Narayana temple. 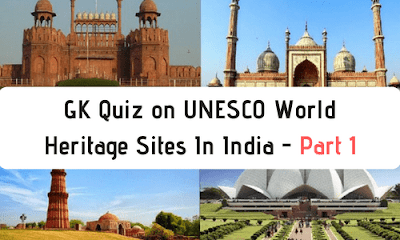 As of now, What is the total number of world Heritage Sites in India that recognized by UNESCO? As of 2018, there are total of 36 World Heritage Sites in India as designated by UNESCO. Out of this 28 are Cultural Heritage Sites and 8 are Natural Heritage Site. Last year in 2017, Which of the following city had accorded the status of World Heritage Site by UNESCO? The first city of India to enter the list, Ahmedabad was declared as the World Heritage City on July 8, 2017.The walled city of Ahmadabad, founded by Sultan Ahmad Shah in the 15th century, on the eastern bank of the Sabarmati river, presents a rich architectural heritage from the sultanate period, notably the Bhadra citadel, the walls and gates of the Fort city and numerous mosques and tombs as well as important Hindu and Jain temples of later periods. Where is the headquarter of UNESCO? UNESCO stands for United Nations Educational, Scientific and Cultural Organisation. It is a specialized agency of the United Nations (UN) based in Paris. It was founded on 4th November, 1946. The Great Living Chola Temples is a UNESCO World Heritage Site designation for a group of Chola dynasty era Hindu temples in the Indian state of Tamil Nadu Completed between early 11th and the 12th century CE. The monuments included the Brihadisvara Temple at Thanjavur, the Temple of Gangaikonda Cholapuram and the Airavatesvara Temple at Darasuram. The Nilgiri Mountain Railway is a meter gauge railway in Tamil Nadu, India, built by the British in 1908. The Railway is operated by the Southern Railway and is the only rack railway in India. In July 2005, UNESCO added the Nilgiri Mountain Railway as an extension to the World Heritage Site of Darjeeling Himalayan Railway. The site then became known as Mountain railways of India. It also includes The Kalka-Shimla Railway, Himachal Pradesh. Konark Sun Temple is a 13th-century Sun Temple (also known as the "Black Pagoda") at Konark, in Odisha located on the east coast of the Bay of Bengal in the Mahanadi Delta. It is built in the form of the chariot of Surya (Arka), the sun god with 24 wheels, and is heavily decorated with symbolic stone carvings and led by a team of six horses. It was constructed from oxidizing weathered ferruginous sandstone by King Narasimhadeva I of the Eastern Ganga Dynasty. The temple is one of the most renowned temples in India and is a World Heritage Site inscribed in 1984 as cultural property. Rock Shelters of Bhimbetka described in the UNESCO Inscription as "a magnificent repository of rock paintings within natural rock shelters" is located in the foothills of the Vindhya range of hills in the Central Indian state of Madhya Pradesh. The rock shelters, discovered only in 1957, comprise a group of "five clusters of rock shelters" with paintings that are inferred to date from the "Mesolithic period right through to the Historical period". It was inscribed as a World Heritage Site by UNESCO in 2003 as a unique cultural property.